If aliens ever appeared in our skies, you'd think the human race would be screwed. After all, any species that's smart enough to travel faster than light would have technology beyond our imagining. But somehow, alien invaders always lose. At least, in science fiction stories, they almost always fail. (With a few notable exceptions, like the brain parasites of Stephenie Meyer's The Host.) Why are alien invaders such pushovers? Here are 10 reasons that science fiction teaches us for the futility of extraterrestrial imperialism. Top image: Vintage Mars Attacks gum card, via K-Type on Flickr. It's weird — as recently as mid-2008, we were lamenting the fact that alien invasion stories were dead as a genre. Now, aliens are invading all over the place once again, and it's important to be prepared. So how are the majority of alien invasions thwarted? Find out below. Warning: Tons of spoilers for old stories! What Would It Take To Bring Alien Invasions Back? 1) An alien falls in love with a human and sabotages the invasion. We posted an example of this the other day, from the 1963 movie Invasion of the Star Creatures. But it also happens in the movies Robot Monster, Teenagers from Outer Space, Cat-Women of the Moon and The Human Duplicators. In the Animorphs book series, two Yeerks, members of a race of invading alien parasites, betray their superiors after their human hosts fall in love with each other. In another book, the characters Cassie and Jake subdue the war-mongering Howler race by infecting its hive mind with feelings of love. The mind-controlling alien in the film The Beast With a Million Eyes is defeated after its first exposure to the feeling of love disarms it. 2) The aliens have a deadly allergy to some sort of plentiful resource on Earth. It could be water, like in Signs, The Outer Limits episode "Specimen Unknown," or Night of the Big Heat. Or maybe it's our atmosphere, as in Quatermass II, Night Caller from Outer Space or Battlefield Earth. It could be Earthly bacteria, which does for the aliens in War of the Worlds. Or it could be car headlights, like in Invasion of the Saucer-Men or The Eye Creatures. Maybe it's cocaine, as in The Faculty. Or country music, like in Mars Attacks or the Twilight Zone episode "Hocus-Pocus and Mr. Frisby," where the aliens are driven back by a harmonica. It could even be Head and Shoulders shampoo — that's what happens in Evolution. aliens in The Arrival, DC Comics' Starro the Conqueror and the Kilaakians from Destroy All Monsters. 3) Their superior technology is used against them. In Independence Day, a computer virus is uploaded into the alien mothership to lower their defense shields long enough for a heroic suicide mission to save the planet. In Killers From Space, Peter Graves calculates that shutting off the power at the local nuclear plant will overload the aliens' equipment and destroy their base. In the 1940's serial The Purple Monster Strikes, the invader Martian is killed by a sonic pulse cannon detached from its own spacecraft. The power source to Nyah's spaceship in Devil Girl From Mars is exploited in another suicide mission to blow it up. The invading robot Kronos has its polarity reversed, destroying it, in Kronos. In Flash Gordon, Ming the Merciless is impaled upon his war rocket, Ajax. 4) They get blown up. In both versions of Village of the Damned and its source text, the Midwich Cuckoos, the alien children are corralled into a room and taken out with a time bomb. The aliens from Creeping Terror and The Man from Planet X are destroyed with grenades. Missiles and rockets are used to quell the invaders in The Atomic Submarine, War of the Planets and Night of the Blood Beast. A prosthetic head filled with magician's flash powder detonates an alien in The Deadly Spawn after it bites down on it. The aliens Eros and Tanna in Plan 9 From Outer Space blow up in their flying saucer after it mysteriously catches fire. Howard the Duck blows up the Dark Overlord by firing a neutron disintegrator at it. And of course, despite the Doctor's protestations that explosions never solve anything, many of the invasions of Earth on Doctor Who are solved by a huge, cleansing blast. 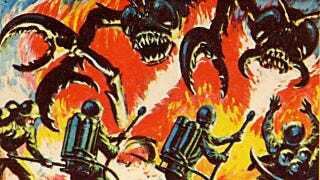 Aliens also turn out to be vulnerable to fire: Flamethrowers, napalm and torches kill the aliens in Night of the Creeps, The Thing, It Conquered the World, Caltiki – The Immortal Monster, The Stuff, The Dark, The Crawling Eye, Invasion of the Animal People and Decoys. Destroyah, from Godzilla Vs. Destroyah, is susceptible to both heat and cold, and is killed by a blast of Godzilla's fire breath after being frozen by a laser. Top image: Doctor Who, "Seeds of Doom" by Darryl Joyce. 5) Superheroes beat them up. It's difficult to think of a hero who hasn't saved the world from alien invasion at least once, but here are some notables: Superman teamed up with Muhammad Ali to fight an alien boxing champion in a match where the fate of the world was held in the balance. In Blue Demon Vs. The Hellish Spiders, the Blue Demon defeats an invading race of spiders that can take on human form. In the climactic battle, he fights the spider queen's chief henchman who's transformed his right hand into an awesome glove-puppet tarantula. In Invasion of the Neptune Men, the hero, Iron-Sharp, combats an armada of metallic Neptunians with acrobatics. Commando Cody and his jetpack defended Earth in multiple serials from the 1950's, including Zombies of the Stratosphere, starring Leonard Nimoy. In Fantastic Four #2, Reed Richards convinces The Skrulls to not invade Earth after showing them some threatening pictures of monsters in a comic book. Image by Gary Frank. Electricity is used to fry alien invaders in the remake of Little Shop of Horrors, The Brain Eaters, Nightbeast, The Quatermass Xperiment, The Thing from Another World and The Flame Barrier. 7) Their single, obscure weak spot is discovered. In Killer Klowns from Outer Space, it's discovered the alien clowns are instantly killed when their red rubber noses are damaged. In the X Minus 1 episode "The Seventh Order," a destructive and telepathic alien robot named George is sent to Earth to spearhead an invasion — And any attempt to attack it is preemptively thwarted. After bargaining it couldn't read subconscious thought, a battalion of snipers is hypnotized to fire upon it after hearing a programed cue. It works, and the invasion is promptly cancelled. In Starship Troopers and Slither, or in the case of Star Trek's Borg Queen, the aliens are controlled by a mother brain, which is either killed or conquered, incapacitating the drones. In Torchwood: Children of Earth, and the film Target: Earth, the aliens are killed by a certain audio signal on a particular frequency — although it's slightly more complicated in the Torchwood story. In Earth Vs. the Flying Saucers, the UFOs are knocked out of the sky by an audio signal coupled with a magnetic field. In They Live and Earth Dies Screaming, the invasion is compromised after the destruction of a radio tower that emits a mind-controlling frequency. 8) The aliens decide they don't want it anymore. emotions and leave. In Evils of the Night, David Carradine, Julie Newmar and Tina Louise play a trio of aliens planning to harvest human blood in a plot to keep themselves as young as possible. Not wanting to get their hands dirty, they conscript two mechanics played by Aldo Ray and Neville Brand as enforcers. By the end of the movie, the aliens seem to lose interest and blast Ray with a laser from outer space. Also, sometimes aliens can be placated with popular culture — as is the case in the Futurama episode, "When Aliens Attack," where the aliens just want to see the final episode of Single Female Lawyer. Or the Tales from the Darkside episode "Distant Signals," about an alien coming to Earth to produce more episodes of his planet's favorite cancelled series starring Darren McGavin. In the movie Critters, and its sequels, alien bounty hunters come to Earth to stop the alien "critters" — something sort of similar happens in Alien Vs. Predator. In Tales of Suspense #15, Goom, an alien criminal from Planet X, comes to Earth with intent to conquer, after following some radio signals. When he asks to round up Earth's most important scientists and statesmen, Goom is publically humiliated after his planet is contacted a second time, and other members of his race are sent to take Goom back to his home world. The aliens identify him as an outcast, and apologize to the humans. Plus, of course, "other aliens intervene" is pretty much the plot of every Doctor Who story about alien invasion. The Hitchhiker's Guide to the Galaxy describes a race of aliens that intended a massive assault on Earth, but due to a miscalculation in the planet's size, were eaten by a dog upon arrival. In the Twilight Zone episode "The Invaders," the U.S. Air Force abandons its invasion of an alien world after discovering the inhabitants are giants. In Alan Moore's Green Lantern story, "Mogo Doesn't Socialize", an alien tyrant named Bolphunga the Unrelenting descends upon a planet to challenge the local Green Lantern, Mogo, but flees once he discovers "Mogo" constitutes the entire planet. An alien named Krangro is sent to Earth in Tales of Suspense #30 to collect three human slaves so he may "break" them before his king. Krangro stuns and retrieves the first three people he sees, but the Earthmen don't react to his merciless beating. Furious, the king puts Krangro to death, and vows never to invade Earth since the people there are too strong. It's then revealed that Krangro's captured "Earthmen" were actually statues of Abraham Lincoln, Theodore Roosevelt and George Washington.